Sen. Ted Cruz and Rep. Ileana Ros-Lehtinen are blasting a decision by the Organization of American States to send officials to visit Nicaragua just prior to its upcoming election, an effort they argue is aimed at legitimizing a fraudulent process to re-elect Daniel Ortega. Ros-Lehtinen (R., Fla.), has repeatedly criticized the OAS, a 35-member Western Hemisphere organization, for what she views as its tendency in recent years to lend its credibility to authoritarian regimes across Latin America. Cruz (R., Texas) has said OAS has lost its way by pressuring Latin American nations, with the help of U.S. funding, to adopt social policies favored by "progressive elites," not its average citizens. "The OAS is meant to support democracy and the rule of law in the Americas, not enable despots like Ortega to dismantle a nation's democratic institutions," Cruz and Ros-Lehtinen said in a statement. "Yet, by sending down this flawed observer mission rather than take any real and meaningful action, the OAS is legitimizing this corrupt and illegitimate process." The OAS did not immediately respond to a request for comment. 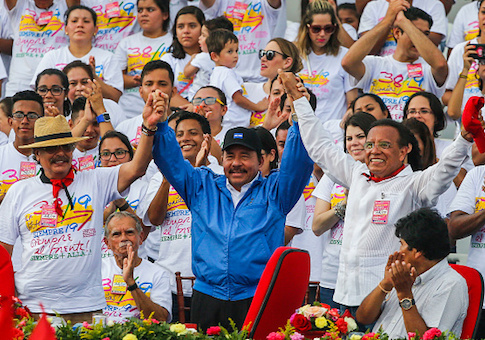 Last week the group announced that it would send observers to Nicaragua's Nov. 6 elections, after Ortega reversed its opposition to outside monitors. Ortega is running as the Sandinista National Liberation Front's candidate for president for the seventh time, as the Associated Press has noted. Nicaragua's top electoral agency—the Supreme Electoral Council—drastically undermined the country's political opposition by ousting 16 legislators that did not recognize the authority of the council, the AP reported. Cruz and Ros-Lehtinen said the lack of transparency in the OAS observation process and mission "all point to a predetermined and favorable outcome for the Ortega regime." They specifically criticized the OAS selection of Wilfredo Penco, an official from Uruguay who served as an observer for OAS in last year's Nicaragua elections, as a member of the observation team, blasting him as "a well-known rubber stamp" for Ortega's electoral manipulation. Carlos Ponce, the director of Latin American programs at Freedom House, a nonpartisan independent watchdog organization dedicated to expanding freedom democracy around the world, said OAS agreed to participate in last year's elections in Nicaragua with the understanding that the Ortega government would reform its electoral process. The regime agreed to improve registration and allow other parties to participate, among other changes. "The year passed with no changes and now [the country's] election law is worse, it's less transparent" and the OAS still agreed to go, he told the Washington Free Beacon. "The Ortega government needs to validate the election … it wants to clean its face using OAS," he added. "The election is less than two months away, there is no time for credible observation and to have any possibility to review the electoral system, the electoral database." Ros-Lehtinen, who formerly chaired the House Foreign Affairs Committee, pointed to a bill she authored with her Democratic counterpart on the panel, as critically needed to help fight Nicaraguan corruption. The measure, the Nicaraguan Investment Conditionality Act (NICA), is an effort to shut down Nicaragua's access to loans. The bill would prevent international financial institutions, such as the World Bank and the International Monetary Fund, from providing loans to the Nicaraguan government other than to address basic human rights and promote democracy, unless the government takes effective steps to hold free, fair and transparent elections. The House passed the legislation last fall and it is pending in the Senate, where Cruz is a main sponsor. "As authors of the NICA Act in Congress, we are committed to passing legislation to help support the people of Nicaragua in their pursuit of a democratically elected government that respects the rule of law, protects human rights, ends corruption, and upholds the democratic principles enshrined in their constitution and in the OAS Inter-American Democratic Charter," Cruz and Ros-Lehtinen said. Cuba's foreign minister during remarks to the United Nations General Assembly Friday denounced the NICA bill as "an act of interventionist behavior." Ros-Lehtinen welcomed the Cuban government's criticism, calling it a "ringing endorsement" of the measure's goals. "I couldn't think of a more ringing endorsement of the necessity to see this bill become law," she said, adding that she plans to continue to work with her House and Senate colleagues to ensure it becomes law and show the people of Nicaragua that the United States supports their desire for a free and democratic society. "It never ceases to amaze me when the Castro regime spews its preposterous rhetoric with no sense of hypocrisy," she said. "Responsible nations must stand together and hold dangerous regimes, like those in Cuba, Venezuela, and Nicaragua accountable for their deplorable human-rights practices, and we must call for free, fair and transparent elections so the people of these nations can truly determine their future." This entry was posted in National Security and tagged Ileana Ros-Lehtinen, Ted Cruz. Bookmark the permalink.